Epson has announced two new photo printers called Epson Stylus Photo PX830FWD and PX730WD. Epson claims that these printers make photo prints of the best quality. The PX730WD printer comes with wireless printing while the PX830FWD is 4-in-1 printer that is able to print, fax, scan and copy. The Epson printers will be available in September 2011 and cost about £259.99 for the Stylus PX730WD and £299.99 for the Stylus PX830FWD. 18th August 2011 – Epson’s latest home photo printers have been specifically designed for photographers who want to print their favourite pictures with better-than-lab-quality results. 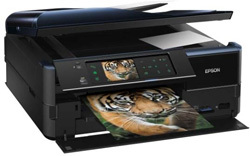 With the additional benefits of automatic Wi-Fi set-up and the new Epson Connect service, users can easily print photos and documents around the home without being tethered to a computer. The PX730WD is designed for those who are serious about their photography but also want to share printing, scanning and copying activities with the rest of the household through its Wi-Fi capabilities. The PX830FWD, meanwhile, is Epson’s premium 4-in-1 for high definition printing at home, offering top-of-the-range features for printing, scanning, copying and faxing. Both printers use Claria Photographic Ink to produce photos that users will be proud to display, having been specially developed as the ideal partner for DSLR and compact cameras. The dye-based ink works to give high definition results every time but is also versatile enough to ensure the rest of the household can use it for their non-photo printing needs. The automatic Wi-Fi set-up makes configuring laptops and computers to print wirelessly extremely easy. Users don’t need to know their network settings or connect with a USB cable, these printers automatically find the relevant connection settings in order to configure themselves. Multiple users then have the freedom to print, scan and copy quickly and efficiently from anywhere in the home. Epson’s new mobile printing service, Epson Connect, offers more flexibility and freedom with printing around the home, allowing users to quickly and easily print photos and documents wirelessly from smartphones and tablet PCs. The Epson Stylus PX730WD and PX830FWD are available from 1 September 2011 and will be priced at £259.99 and £299.99 respectively.